La Piazza has been serving good quality, traditional Italian cuisine to the people of Bankstown and beyond since September 2007, offering pizzas, seafood, pasta, tapas and gelato in an authentic Italian streetscape setting, with a feel for the old country. 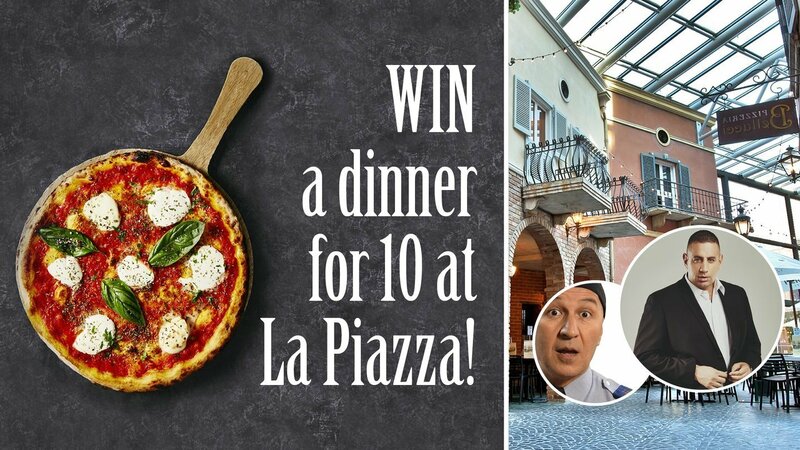 In recognition of La Piazza’s 10 years in business, we want to know what your favourite memory is of La Piazza! Maybe you got engaged in La Piazza’s garden area, or you celebrated your parents wedding anniversary in Stuzzichino? It might be where you and your girlfriends have your regular catch-up or it could be your children’s favourite place to eat? Visit bankstownsports.com/lapiazza10, complete an entry form and share your fondest La Piazza memory in 25 words or less, to go in the draw to win a dinner for 10 in our exclusive VINO dining room, valued at $1,000. The winner and their party will also be treated to a guest appearance by comedians Rob Shehadie and Tahir, who will pop by for a visit. The competition runs from 1 June – 31 August 2017, with the winner selected on Friday, 1 September 2017.